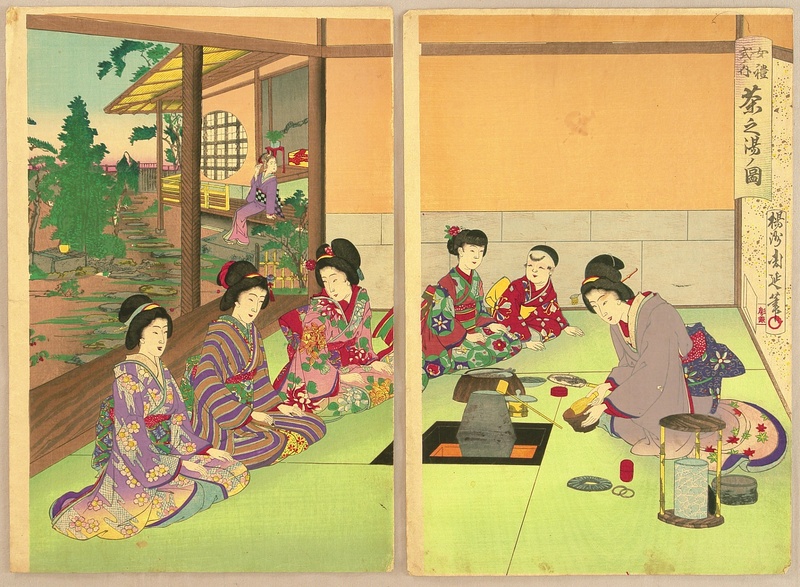 Started in the 9th century, the Japanese Tea Ceremony has its roots in Zen Buddhism. An elaborate custom, it is performed for meditation, entertaining guests, or simply for pleasure. There are numerous variations on the ceremony, depending on the participants, occasion, and even the season. Having many different forms but a deep, spiritual meaning, the Japanese Tea ceremony has become one of the most well-known traditions of Japan. Chawan, or Japanese tea bowl. Hot water: Not boiling! The water should be at around 60° Celsius (140° Fahrenheit). Too hot or boiling water will burn the tea. Also, for best results, use mineral water—it will enhance the flavor. Chashaku, or bamboo tea scoop. This is the bamboo spoon used to scoop the matcha powder. Chasen, or tea whisk: Cut from a single piece of bamboo, Chasen are distinguished from each other by their roughness and the number of bristles they have. The bristles are referred to as tate. Tea Canister, or caddy: These come in a variety of shapes, sizes, and designs. Matcha green tea powder. Use Ceremonial Grade matcha powder for best results. 1.) 2-3 scoops of Chashaku bamboo teaspoon matcha powder (~2 grams of matcha powder) or about 1 full teaspoon of matcha powder. For Koicha (thick tea), use 4 grams. 2.) Add 3-5oz of hot water onto the Chawan tea bowl. Or, about 1/3 of the Chawan. Remember only hot water at 60-70C (160°F to 170°F), just below boiling. 3.) Hold the Chasen whisk with 3 fingers (Thumb, Index and Middle finger), use a brisk but quick short left-to-right motion to whisk the powder. 4.) Continue until a light green foam appears. 5.) Shake the whisk off and wipe off any liquid on the Chawan Bowl. *Please note, the tea bowl is never filled to the brim, but to a maximum of 2 fingers from the brim. While frothing the green tea, notice the slowly ascending aroma. Please be conscious of the four (4) fundamental principles when enjoying matcha: harmony (wa), respect (kei), purity (sei) and silence (jaku). Regular 1/2 teaspoon for every cup of water. Whisk.......no need to steep (a frother or blender can also be used). Hot water at 60°C to 70°C (160°F to 170°F), just below boiling. It is a good practice to boil the water first and let it cool for a few minutes before adding to the matcha. Mineral water is highly recommended because it enhances the flavor. Hard water is preferred over soft water. Distilled water without any minerals is discouraged as it will brew a tasteless tea. Green teas are damaged by heat, humidity, light, air and smell from other substances. Be especially careful with the storage of matcha since it loses its color and quality very quickly when exposed to those things. It is recommended that it be refrigerated after opening. Once opened, it should be consumed within a relatively short period (we recommend 4 weeks). If matcha has to be kept for a long time, it may be stored in a freezer. To prevent frozen matcha from becoming wet when exposed to air it should be thawed up to room temperature before the package is opened. Even matcha which is just kept in a refrigerator should be permitted to return to room temperature before being opened.